Today I created a Collage about matariki, I put some of my favorite photos that I have found on the internet that celebrates Matariki and also putting the names of the 7 Stars of Matariki. 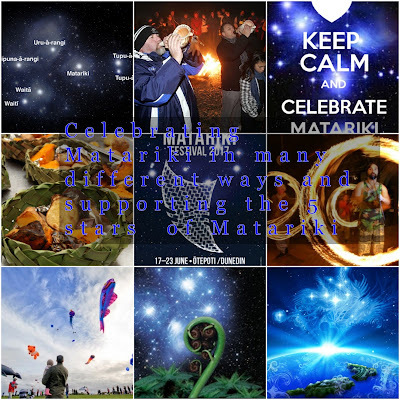 The reason why I was making a collage is because its for people to recap of the things or a way of celebrating Matariki as either a community or a family. This may help people to try and make something like a weaving harakeke or some things that can put into your house of bonfire to celebrate Matariki. What made me create a collage is that its to help them protect us by giving them credit and telling them if they can help the world. This made me interested of creating this and I liked it because I've added the names of the 7 stars so that people might know why they call it the seven stars. That is all for today and I hoped you enjoyed this blog post, Please leave comments on my blog posts.